Microdermabrasion is a controlled stream of natural mineral crystals to gradually ease flaws and blemishes. 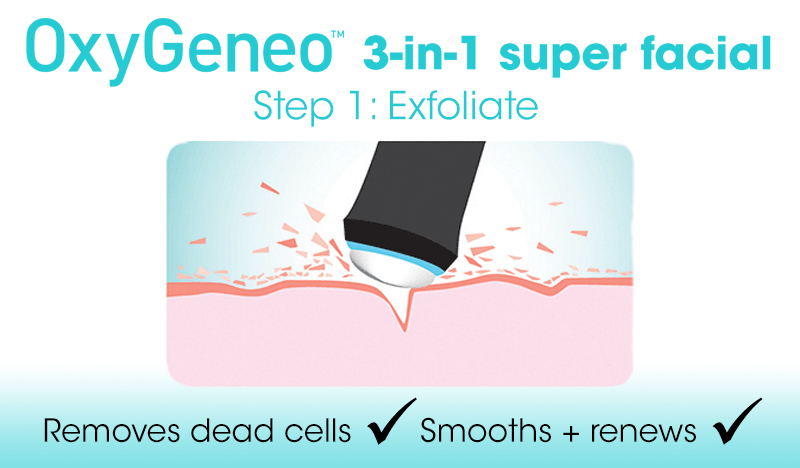 Each pass removes a precise amount of surface cells revealing newer and healthier skin. It refines pores, coarse and granular skin, reducing uneven pigmentation while soothing superficial scars, fine lines, wrinkles and blemishes. Combines the effects of light energy, micronized currents and HF Polarized currents to produce skin rejuvenation that is safe, comfortable and effective. Light energy pulsates wavelengths, using high-power density to stimulate cell functions and repair mechanisms. Red light alone increases your natural collagen production 5 fold in the skin. Our panel chooses 4 wave lengths – red, yellow, green, and blue. Each well absorbed by skin tissue, the combination optimizes the results of the treatment. Phase 2 is transmitting micro currents through lifting electrodes to re-educate muscle tissue achieving visible lifting results, restoring facial contour, and slowing the aging process. Phase 3 HF Polarized currents (no sensation) are used to gently smooth away fine lines and wrinkles. Also used to penetrate an anti-aging complex. Revolutionary skin rejuvenation treatment that effectively stimulates new collagen growth in deeper layers, replacing aged and sun damaged collagen, plumping the skin, smoothing wrinkles, tightening and lifting muscles and skin. Combines Ultra-sound, Micro currents, HVPC current, Electroporation and Iontophoresis. Restores muscle tone, lifting and tightening, relaxes dynamic lines and smoothes wrinkles. Activates neo-collagen formation restores volume and elasticity to skin. Stimulates cell renewal and growth of new, healthy skin. Series of 12 treatments, 2 per week is recommended. Keeping in mind it takes 2 weeks to start the regeneration of your own natural collagen production. Monthly treatments are recommended to maintain. Skin aging is a complex and varied process. Many factors influence how a particular individual’s face will age. Heredity factors such as bone structure and soft tissue positioning will influence the aging process dealing with chronological years. It is estimated that as much as 96 percent of visible signs of aging are a result of cumulative sun damage. These include fine lines, wrinkles, textural changes, brown spots, loss of elasticity, coarse dryness, blood vessel damage, skin growths, breakdown of collagen and yellow or gray tinges due to a decrease in the small vascular vessels that provide circulation to the surface of the skin. Collectively these changes caused by cumulative sun exposure can be referred to as quality of skin. The good news is that many of these changes can be avoided and/or new medical validated skincare technologies can target specific aspects of the skins response to the sun exposure, enabling the skin to protect itself or reverse certain changes for a more youthful appearance. The bad news is that approximately 80 percent of the sun damage that will reveal itself on the skins surface was programmed to appear from sun exposure that occurred before the age of 10. It generally takes 10 to 30 years for sun induced aging to appear. Doctors now recognize that many topically applied agents can assist in reversing the skin changes associated with environmental exposure. Accelerated skin aging that is caused by cumulative sun exposure is a complex reactionary process. This process consists of countless changes that involve altered DNA biochemistry, breakdown of cell membranes and destructive effects on enzymes, proteins and amino acids, as well as abnormal changes to the immune system that are essential for information processing necessary for healthy, youthful skin. Today, we have many options to help improve the quality of our skin. We can resurface the stratum corneum (Microdermabrasion) resulting in significantly smoother and younger appearing skin. Dramatic results can be achieved with regard to improving coarse uneven texture, fine lines wrinkles, and discoloration. At Bren’s we also incorporate Skin Remodeling, Light therapy Procedures and Scientifically proven, award winning products. In fact the products used at Bren’s were recognized in both 2010 and 2011 winning the “best product sold in a doctors office”. With the combination of our experience, current technologies and one of the best product lines currently on the market for anti-aging, we can achieve some amazing results. After a preliminary skin consultation and assessment, our knowledgeable staff will choose the perfect professional grade products and treatments to meet the specific needs of your skin. This exclusive combination improves skin tone, evens texture and nourishes the complexion – giving you a balanced healthy glow. For long term try a treatment series. 3-in-1 Therapy gives better results; enjoy the benefits of exfoliation similar to microdermabrasion, but with no downtime, plus deep facial rejuvenation with the infusion of essential revitalizing nutrients and healing skin oxygenation from within. 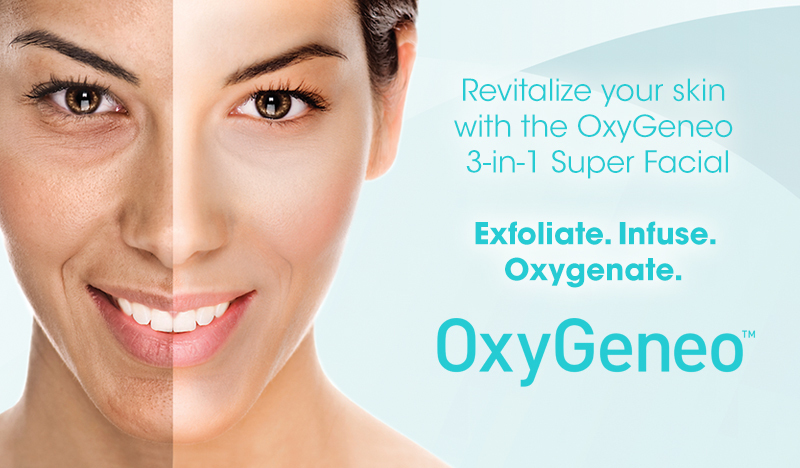 OxyGeneo™ treatments are suitable for all skin types, including sensitive skin. Breakthrough OxyGeneo™ technology provides superior anti-aging results by treating the skin at a deeper level. Exfoliate, Infuse, and Oxygenate your way to youthful skin. Similar to microdermabrasion, the OxyGeneo™ Super Facial exfoliates the upper skin layer to remove dead cells, smooth and renew the skin, preparing it to receive active nutrients. The OxyGeneo™ is safe on all skin types and we can treat sensitive skin without irritation. 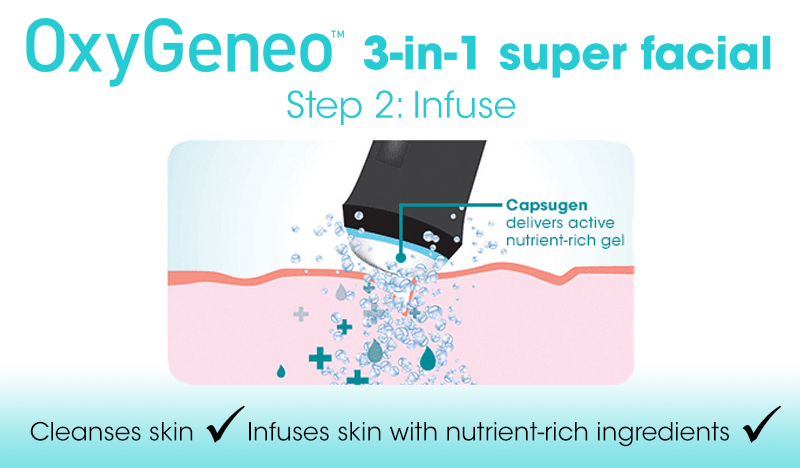 Through our exclusive Capsugen, the OxyGeneo™ cleanses the skin while infusing nutrient-rich active ingredients. You choose between the NeoRevive™ for rejuvenation and anti-aging or NeoBright™ for skin brightening and texture improvement. 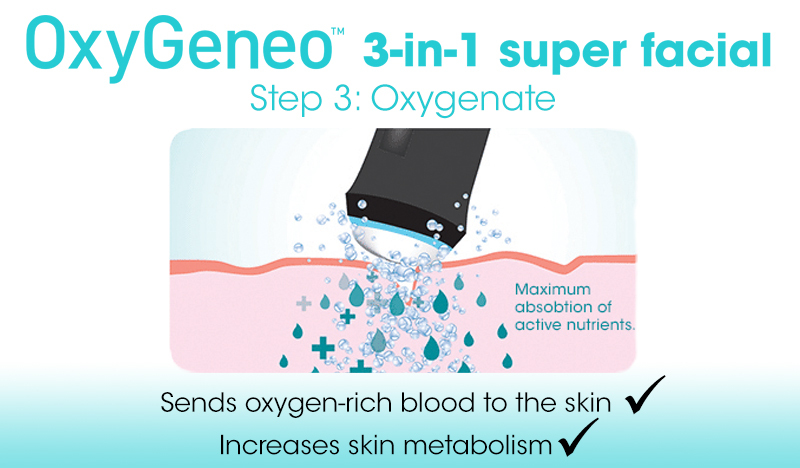 The OxyGeneo™ produces CO2 bubbles which gently burst on the skin surface creating a physiological response, sending oxygen-rich blood to the area, increasing capillary flow and skin metabolism. Oxygenation results in optimal absorption of active ingredients. TriPollar Radio Frequency (RF), technology is an innovative, proprietary 3rd generation technology, which was designed to overcome the limitations of previous mono-polar and bi-polar technologies. Simple to use and remarkably efficient, TriPollar treatments deliver skin tightening, treatment of wrinkles from the first treatment, and long-lasting results after a course of treatments, without surgery or downtime. TriPollar technology, utilizing painless, focused and optimal radio-frequency (RF) energy to the dermis and to subcutaneous fat layers. Controlled energy is delivered via three or more electrodes, and is limited to the treatment area. This focused delivery results in immediate visible results. For improved results it is recommended to undergo a course of treatments. TriPollar® RF is clinically and histopathologically proven to simultaneously and homogenously heat both superficial (dermal) and deep (hypodermal) layers While treating the body. Both 1st generation Mono-Polar and 2nd generation Bi-Polar RF technologies are non-focused, and, therefore typically require much higher energy to achieve results, attained by heating of the skin. Notably, this may cause pain and poses a higher risk of burns and damage to the skin. In addition, these technologies may require cooling mechanisms to mitigate risks, which result in less efficient heating of the skin layers. By contrast, TriPollar 3rd generation RF technology has a unique configuration of sophisticated control algorithms that causes the tissue to heat from within while keeping the epidermis safe. The focused Tripollar RF− due to its high density− enables the use of low energy, thereby providing immediate and long lasting results. Due to the relatively low power needed to perform Tripollar treatments, these procedures are painless and pleasant. TriPollar technology enables treatment of fine lines and very delicate areas of the face without causing damage or pain. These include areas around the lips (perioral) and around the eyes (periorbital). Collagen and elastin are produced by fibroblasts. As they are heated, they contract and are pulled together, resulting in immediate skin tightening. The deep heating accelerates the conformational changes of the collagen and the elastin, resulting in tighter and smoother skin. In addition, the thermal effect triggers the fibroblasts to increase the production of new collagen, elastin and hyaluronic acid which in turn augment the newly achieved younger skin appearance.